Blue Suede News #51: Sonny Burgess, Siegel Schdwall Band, Hemsby Weekender, Viva Las Vegas, Ned Sublette, Wayne Hancock, Rockabilly, Blues, REAL Country Rusic, '50s Rock'n'Roll! Issue #51 - Summer 2000 - Scroll down to order!! 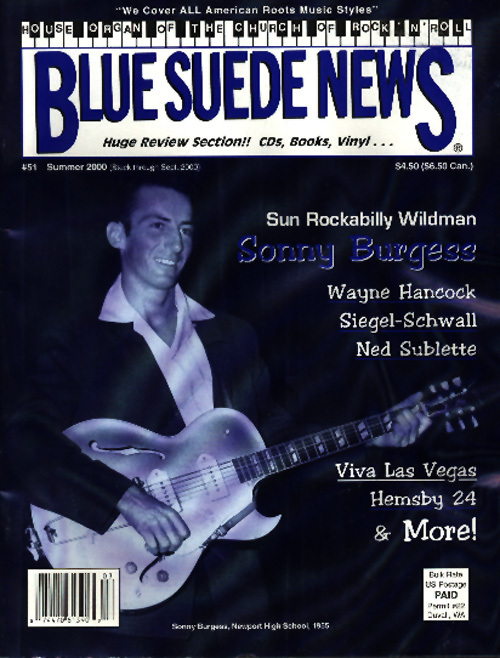 Blue Suede News #51 (summer 2000) has 68 pages with a slick cover and features a cover story about SUN Rockabilly wild man Sonny Burgess, one of the most amazing acts on Sam Phillips' Sun label out of Memphis. Sonny still rocks like crazy today although he never made it as big as label mates Elvis, Johnny Cash and Carl Perkins. He talks about the early years in this interview and boy is his memory good and amazing stories are being told here! There is also a story about The Siegel Schwall Band, Corky Siegel and Jim Schwall started out in 1965 and got to back great blues music legends like Howlin' Wolf, Muddy Waters, Little Walter and Otis Spann. A big feature article about the Hemsby Rockabilly weekender #24 is included with lots of cool photos. It's the biggest Rockabilly festival in the world with 5000 fans attending each year. It's written from the point of an American fan and artist appearing at this English 5-day event with Tommy Sands, Donnie Brooks, Larry Donn, Ronnie Dawson, The Olympics, Freddie Bell and lots more. There is also a feature about The Viva Las Vegas Rockabilly weekender, headlined by Alvis Wayne, Ray Condo, Eddie Bond, Jodie Reynolds, Mack Self, Mack Stevens, Lew Williams, Paul Burlison and others. This issue also has an interview with Ned Sublette, titled Rumba, Western Syle. Wayne the Train Hancock also gets interviewed about his so called alt. Country. He's the real deal, the Hank Williams of this century. On the Blues side we get to hear from T-Model Ford, a 78-year old bluesman from the deep south and now recording for Fat Possum records.